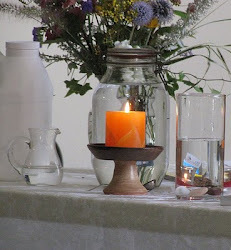 UU A Way Of Life: Friday Night Class - Religious or Spiritual? Friday Night Class - Religious or Spiritual? I am starting a new column on UU A Way Of Life entitled Friday Night Class. The articles will be conversational in tone on spirituality and Unitarian Universalism. Question: A lot of people say now days that they are spiritual but not religious. Having been brought up in a faith tradition, I don't quite know what to make of this. Is it possible for people to be spiritual and not religious? Answer: Each person probably means a little something different by this. I define "spiritual" as a person's relationship with his/her Higher Power whatever or whoever they conceive of that as being. It can be a personal God, Mother Nature, an energy, or something as ephemeral as Love or as intangible as the Spirit Of Life. Religion is manifested in social institutions which teach certain beliefs, certain practices, and sanction certain officials to lead the organization. These religious organizations have traditions, rituals, symbols, and myths which members are expected to believe, comply with, and revere. I have known some people who are spiritual but not religious, and religious but not spiritual, and both spiritual and religious. Some people argue, mistakenly, that a person must be religious to be spiritual, but this is not true. Many Atheists have spiritual experiences listening to music, enjoying good art, helping others, enjoying nature, using their talents and abilities in creative and satisfying ways, falling in love, enjoying life, and dealing with the suffering in life in ways that respects and validates their spirit and the spirit of others. As people grow and mature usually their consciousness becomes raised and they move beyond their own narcissistic interests and come to understand at a deeper level what matters in life. Knowing what matters is my favorite definition of Wisdom and the development of Wisdom and the development of one's own spirituality are intimately connected. People today experience themselves as very divided. They are not in touch with their deeper selves, their deeper spirits. They try to obtain physical comforts and pleasures which often turn out to be meaningless. They try to be somebody they are not to gain the approval and love of other people, to attain more status and power, to situate themselves in a social position or role which they have been told will make them happy, but unless they are true to themselves it will only create frustration, depression, and anxiety. The most widely prescribed medications in the United States are antidepressants and United States citizens take more antidepressants than any other country in the world. At a societal level, this is because the U.S. has lost its soul and religion no longer provides meaning and consensus for the majority of the population. The current religion in the United States is Capitalism, and Greed is the new virtue, shopping the new religious practice, consumption the new sacrament, and the dollar bill the symbol which all Americans worship. Capitalism, though, is spiritually dead. It overlooks human connection, dignity, compassion, and support when the most important consideration in our social transactions is the bottom line. Christianity, the previously dominant religion in the United States, has formed deep and intimate alliances with Capitalism, and material riches are seen as a sign of God's favor, and poverty a sign of God's disdain and contempt. Mother Theresa said that while America is the richest country in the world, it is spiritually the poorest. Our Unitarian Universalist faith is placed in our seven principles/values. Making money is not one of them, spending money is not one of them, accumulating wealth is not one of them. Rather Unitarian Universalists encourage the valuing of the inherent worth and dignity of every person, something which Capitalism does not do. Unitarian Universalism encourages justice, equity and compassion in human relations, something which Capitalism does not do. Unitarian Universalism encourages the respect for the interdependent web of all existence, something which Capitalism does not do. Jesus was clear about the worship of money. He said that it is easier for a camel to pass through the eye of a needle than for a rich person to get into heaven. Why? Not because there is anything intrinsically wrong with money if it is put to good purposes and used in supportive ways for the benefit of all, but when an individual, a group, an organization, a country put its faith in money instead of in their just, compassionate, understanding support, and care and concern for one another, the spirit dies. Religion in America has lost its spiritual roots as it has been co-opted by Capitalism and Greed. In the Christian church this started in the third century when Constantine made Christianity the State religion. In the United States it was Calvinism that stole the soul of America. 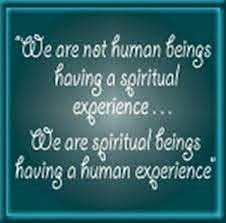 If you would be deeply spiritual ask yourself what it is that you most deeply value? Then ask yourself how you live you life? It is authentically true to yourself and your values, or are you divided? Many people are divided causing depression, anxiety, addiction, psychosomatic illnesses, interpersonal problems, and much suffering. If you are inclined to get involved with a religious organization what are it's values not in terms of what they say, but in terms of what they do and how they act towards themselves and toward others in the world. Spirituality facilitates a deep connection for each person with his/her true self, a deep connection with life's true gifts instilled by experience as a sense of gratitude and awe, and a desire to connect with the external world in ways that build it up to realize it's greatest potential for good, joy, peace, and love. Religion too often is constraining, oppressive, subjugating, and contributing to what Sartre calls "bad faith". In the Postmodern world, people are increasingly skeptical of religion, but also yearn for the meaning it provides especially in the face of suffering and death. As it says in the New Testament, where you put your faith is where your treasure is. Mammon, Capitalism, the Golden Calf, is destroying our spirit. It is time for us individually and as citizens of the world to reassess what we have put our faith in. For first world nations, our faith in Capitalism is fundamentally corrupting of the spirit. Our treasure is not to be found in the bottom line but in our love for one another. Looking at how many on Facebook and other social networking pages describe themselves I think it might be a lot higher. These polls are terribly misleading. For example, most people who describe themselves as Christian don't go to church except rarely. Identifying with a religious tradition is more a cultural phenomenon than a religious or spiritual one. This observation includes UU as well as Michael Durall (The Almost Church) points out and from whom I got the idea for the name of this blog. Identifying with a religious tradition and taking it seriously and knowing anything about it are two quite different things when the pollsters dig a little deeper. Capitalism is the dominant religion in the United States for all classes. We worship money and consumption. Wal Mart has become the modern Cathedral and the Wall Street stockbrokers the new clergy who work the miracles mutliplying people's 401Ks. Yes, I agree polls are misleading and this one is a small sample but has some statistical validity as opposed to the internet response type which are a farce. And many people lie about what they think they 'should' be when asked this type of question. I think the Pew Forum makes the best effort to honestly conduct surveys on religious topics. Check here: http://pewforum.org/ In any case, you are right and it is hard not to be cynical.